Most times when people see mold they see it in their showers at the seams where a nice thin strip of caulking lays. However, there is another spot where mold can grow and that is on the grout itself. That might come as a shock though. It is as if it is hiding in plain sight because you can get used to seeing it. This can be cleaned and then have a sealant applied to prevent mold from returning. Grout Restoration Works is your professional tile and grout cleaners to make sure that your tile and grout are clean and mold free. We do more than just make it look nice, we make it look new again! If you’re seeing mold on your grout or caulking, try these tricks and if it’s not working then call the professionals today! Dish detergent is a great degreaser. This is much needed when cleaning your tile and grout. You’ll want to use hot water. Boil hot water for a couple of minutes on the stove then a little dish detergent and scrub away. When we say scrub away we mean with a nylon bristle brush if you have sanded grout. If you have non-sanded grout, you’ll be just fine with a wash cloth. Sometimes a cloth isn’t enough to get the mold off the grout though, when this is the case you can use a bristled brush. Don’t apply a lot of pressure though because non-sanded grout comes out a lot easier than sanded grout. This should do the trick though. This is a simple solution with just hot water and vinegar. This is a great mixture to be able to clean mold off your caulking. There are going to be some cases where the mold on your caulking won’t be able to come off but in fact it could mean that it is growing from behind and just now showing. When this happens, the caulking will need to be removed completely and a mold treatment applied to kill what can’t be reached. 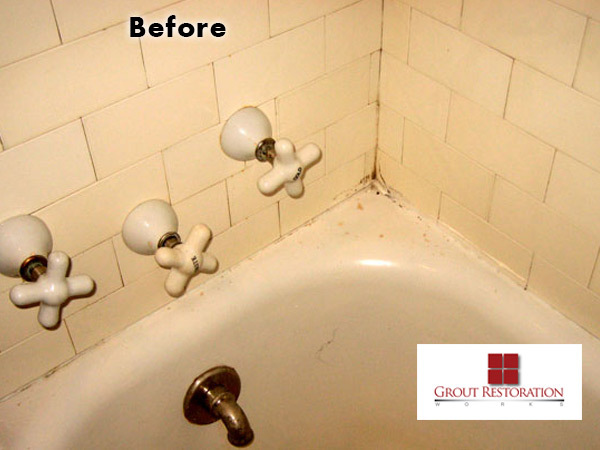 Grout Restoration Works can do this work when you’re not able to clean it with a simple rag and cleaning solution. Mold is something that everyone dreads! It can come unexpectantly and grows without our knowledge until it’s too late. Nothing is too much for Grout Restoration Works to handle, we are able to handle all your grout and tile needs! Call us today for a free home estimate!